I don’t like winter. I don’t like cold weather, ice or snow. But then, I am also the first one to complain about the heat and humidity in the summer. I recognize there are advantages and disadvantages to every season, as they all offer opportunity to grumble and complain, or approve and applaud. Eight years ago I entered the winter of my life when my husband was diagnosed with cancer. A fierce storm took over and in a short 77 days, everything changed. Fast forward to February 2019 and more change is coming. I plan to retire. There, I said it out loud. As scary as giving up a steady paycheck is, there is excitement ahead as I pursue my next season. Each season we enter, is a step toward another season until that day when Jesus calls us home. God called my husband, and one day He will call me. But, until then, life goes on. During my preparation for this next season, besides creating a new budget, I realize that I must sell my home. This is a major step for me and something I dreaded for some time now…until this morning. The first hour of my day is spent sitting in my family room sipping coffee, reading my Bible, and writing in my journal. Today, as I sat pouring my heart out to God, I asked the Holy Spirit to impart wisdom and discernment regarding a few decisions I needed make. Peace covered me. As an introvert, I relish my alone time and I love the warm sensation of early morning silence coupled with God’s Word. This verse stood out as I read from scripture, “Therefore do not worry about tomorrow, for tomorrow has enough trouble of its own.” (Matthew 6:34) I went on discussing my situation with Jesus and reminded Him that I really did not want to sell my home, I loved it. I asked for peace about this. The words for this post did not come easily. I wrote, I edited, and then erased many times. I couldn’t understand why I experienced such difficulty while formulating my feelings and getting them down on paper. After eight years of widowhood, God spoke such words to me today. Faith sustained me and brought me full circle; from a single young woman to a married lady of 41 years, to a widow of 7 years. This circle of life brought me through good times and rough challenges. I accomplished things on my own I never dreamed possible nor ever wanted to explore. And God continues to uphold and strengthen me. Life is a puzzle. Some days it’s a crap shoot; a combination of uncertainty and risk. Some view life as a challenge – oh, those extroverts! Taking a chance on the unknown, requires lots of prayer and faith. I find this to be truer for me as a widow. At least before, when I got myself in a jam, I had help getting out of the mess. Not any longer, I am on my own, but I know God is with me. I am suddenly more willing to try some things. The years mount up, and I realize I don’t want the rest of my life to pass me by. I begin to dream a bit more. Perhaps I can step into a few of these dreams; at least put my toe into the water to determine if the temperature is okay. So much uncertainty. This past weekend I spent a few hours working in my yard. I love this type of work and find therapeutic value is priceless. Often, I am lost in my thoughts while digging in the dirt. My mind will take me to places my husband and I dreamed of going. Too often reality sets in and I cancel those mental plans. Sweat pours down while on my hands and knees pulling weeds. How do these unwanted entities thrive? I must admit, their tenacity fascinates, and I envy their ability to grow and flourish during drought or abundance. The hot and humid weather causes the grass to brown early and I doubt the lawn will green up again this season, but the weeds, that’s another story. They can be found tucked into every nook and cranny, basking in the oppressive sunshine and relaxing in the shaded corners. This kind of resiliency during the harsh seasons of life is a wonder. Spotting a volunteer tomato plant peeking out from under my baby’s breath, I think I want that kind of faith, of courage, of steadfastness. I dream of packing up A.J. my faithful yellow lab and hitting the road. Of course, once again reality makes an appearance and shuts me down. One day real soon, I will behave with abandon. I will screw up my courage, like the volunteer tomato plant and put down a few roots in a place unknown to me now. Wouldn’t it be wild to try something new without thinking it to death? Is now is time to venture out, shake off the mantle called widowhood? To explore new territory and have the best time of my life? Why not? God is with me! Note from Judy: I plan to post at least once a week from now on. I have a new outlook on life and widowhood and will share some of these thoughts and plans and yes, dreams with you. I do hope you find this helpful and that you will share yours with me and other readers so we can move forward together, with God’s help. This month marks the 7th anniversary of the end of Dave’s earthly life. It marks many other things too – the loss of a friend, a brother, father, and husband. While Dave’s life has begun again in Glory with Jesus, those left behind still must go on. Until that day we are reunited, we have pain. Our loved one does not. Seven years is a short while, and yet a long time. Dreams that once were, are no more; but new dreams have replaced the old. I have done so much dreaming over the years that I felt stuck, in the same old story. Recently I heard this statement, and it stuck with men it is now the tune I sing. Make memories of your dreams and they will last a lifetime. This is brilliant and I am moving forward singing this song. For years I have been reaching for the stars, my personal stars, only to stop short of attaining them. I have chased after the dream to write since I was a teen. So much so, that I think my friends are tired of hearing it. I know I have a passion for writing, and a gift – at least enough of one to learn the rest. So, from this day forward, no more living in the past, chasing dreams from years gone by. No, from now on I have every reason and ability to make memories out of my dreams. 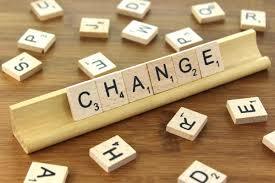 Change: Don’t want to live with it, can’t live without it! Tomorrow is a word I contemplate more often than many would say is healthy. I know I should stay in the moment, grounded in the here and now, but it is difficult to do this when so much of my past was focused on what tomorrow would bring. As a newly-wed, tomorrow was filled with exciting new destinations. Time moved forward once our girls were born, and as a young mother, tomorrow contained a picture of raising children. They moved through grade school and into high school and included all the milestones in between. School sports, plays, awards, musicals and the myriad of friendships. The high drama of first boyfriends, break-ups and then engagements and weddings. Life was full. There were times it was moving too fast and I just wanted it to stop, if only for a day or two. Our family of two which blossomed into four remained that way for about 20 years. Then change happened. Change is certain and necessary. Without it we are stuck in place. Without seasons, nothing grows properly, no one moves forward. Change is healthy if not inevitable. It doesn’t do anyone any good to stay stuck in the moment. But, that is not what is meant by living one day at time. No, one day at a time means to me, that I must not get ahead of God. I need not borrow trouble from tomorrow, just deal with today and keep focus on now. God has tomorrow covered. Change is hard to swallow sometimes, heartbreaking many times, but it is what it is. I know that God will never change and will always be at my side, ready to hold me up when I need to lean into Him. The further I journey down the path called widowhood the better I understand this will be a life-long expedition. One doesn’t discount 42 years of marriage and simply move on; it is a deliberate process, and one with many side trails and detours. While it is six years since I put on the mantle of widow, each of those years is different. Each of those years presented new emotions situations and they needed to be dealt with. When I initially titled this blog I did not know how spot on I would be. For me at least, this place I find myself, is so much more than just grief. Grief is what I got caught up in the first year or so, but then the concept of widowhood took on a new tone. The day I realized I was single I think I experienced a stunning blow to my personal identity. I found I denied this new description and clung to widow – at least that conjured up attachment, a belonging of some sort; even if it was in the past. This journey would be so much more difficult if I did not have the comfort and the blessed assurance of my Lord and Savior. The words of Psalm 23:4 ring true for this believer. “Even though I walk through the valley of the shadow of death, I will fear no evil.” Knowing in my heart that I will see my husband again makes all the difference. My prayer life has developed and grown since I lost my husband almost five years ago. Prayer was one practice I could perform that would help me feel safe and secure. I discovered that prayer provided comfort and served as an outlet for my emotions. When I didn’t feel I could get through another moment, prayer brought me into the Presence of God. Not long ago, I was looking for a new devotional for my early morning quiet time when I discovered, The Battle Plan for Prayer by the Kendrick brothers. This book, inspired by the feature film, War Room, is a 35-day reading plan. It is centered on prayer: types of prayer, postures of prayer, rhythms and strategies for prayer and so much more. I use this book as part of my morning routine and when I turned the last page, I started all over again. You will find this book an inspiration and a motivation to pray. It helped me to examine why I pray and then revealed my areas of weakness. The scripture references are sound, and they direct the reader to a closer relationship with The One who makes all the difference. Each daily reading takes about 10 minutes, providing an opportunity to dig deeper into God’s Word by looking up scripture references, or, if you are like me, you can open your journal and begin a dialog with God about what you heard during your time with Him. Talk it over with Him and know that He hears. Prayer is described on the pages of this book as, “…our armored tank…our major assault weapon in battle.” You will want to keep your colored pens or highlighter handy as you work your way through the pages of The Battle Plan for Prayer. No matter if you find yourself feasting on His Word daily, or if you struggle to make time for it, this little book can help you on our journey to pray with more intentionality and with faith. Each daily reading ends with a prayer which launches the reader into the day set before them. I would highly recommend this to a new Believer or a veteran prayer warrior. If you are a newly-wed or a newly-widowed there is comfort, hope, and direction to be found in these pages.